"Taking to the Courts with Heavy Artillery...WeissCANNON USA!" Guts and Glory Tennis continually playtests and evaluates strings with the goal of identifying the best performing strings for our customers. Modern technology has allowed the production of co-poly strings to take quantum leaps forward in terms of overall performance. Guts and Glory Tennis has been on the cutting edge of these advancements and has consistently been the first to offer the top performing strings to our customers. The WeissCANNON series of poly-based strings clearly ranks at the very top and we are proud to be the US distributor. MatchPower is one of the absolute best values in Poly-based strings. This string offers excellent comfort and performance. Couple the comfort, feel and touch with high marks in tension maintenance you have one outstanding product. The string is orange, but it is not to be confused or associated with the Poly Plasma. The MatchPower is unique with its own characteristics. Users of both with find the MatchPower to be more powerful, more durable and more comfortable with a feel that is unlike any other. Construction: Premium quality CoPolymer fearturing soft poly elements and a UNIQUE nano coating which makes the string smoother and softer while providing additional durability. Advantage: Simple. If you are looking for comfort along with durability and OUTSTANDING tension maintenance, the MatchPower should at the top of your list. Why We Carry This String: The MatchPower fills a unique role as an extremely comfortable and well-playing CoPoly that holds tension incredibly well. Because of these properties it is an excellent offering for players who are seeking some of the control advantages of poly-based strings. Buy More and SAVE! - We now offer a Wholesale/Volume Discount Buying Program for pro shops, tennis retailers, schools, coaches and USRSA members. If you are a member of one of these groups and are interested in saving through volume purchasing, please contact us and we will be happy to provide you with additional information. MatchPower offers an impressive blend of responsive feel and touch combined with control, power and durability. The comfort of this string will immediately strike the user. Because of the comfort and overall performace of this string it is an excellent choice for young players and those who have never been exposed to a poly-based string. One of the many desirable features of this string, in addition to the power, comfort and durability is tension maintenance. This string has put up impressive tension maintenance numbers for the WeissCANNON USA playtesters. CONSTRUCTION: Premium quality poly-based string featuring soft poly elements and a nano coating which makes the string smoother, softer while adding additional durability. COMMENTS: Because of the color, many ask how this string compares to the Signum Pro Poly Plasma. The construction, chemical makeup and performance of the MatchPower is different. Both are soft and comfortable poly-based strings that share excellent tension maintenance, but that is where the similarities end. The MatchPower offers more power, better durability and added comfort. It is not intended to mimic the Poly Plasma. The Poly Plasma is an outstanding string and the MatchPower targets a different user. The MatchPower stands on its own merits and should be judged as a stand alone product. TENSION: Using an ERT 700 we took the following tension measurements of the MatchPower 1.25mm in a Yonex RDti 80 which also collected on court playing time during the measurement period. For comparison purposes, please note that many current poly-based strings routinely lose 15 - 20% tension within 24 hours. Why not conduct a personal playtest today? We have tried to make it easy by allowing you to place a set or more in your shopping cart directly from the left column of this page. 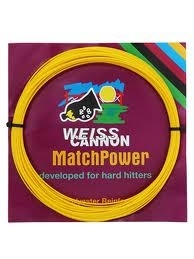 Please follow the WeissCANNON MatchPower 660' Reel link if you prefer to save money by ordering in larger amounts. Everyone should try this at least once. This sting has it all: it's extremely comfortable, it's amazingly durable, holds tension a long time, has excellent control, it has power and you can rip it with nasty spin. Enough said. No disappointments with this string. Reviewed Tue, May 03 2011 12:32 am by Paul M.